This medieval abbey in France sits dramatically atop a large conical outcropping that rises conspicuously above the surrounding sea and coastal flatlands. 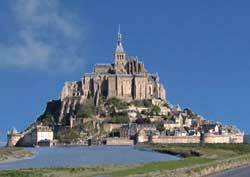 Mont-St-Michel used to become an island on a twice-daily basis when the high tide encircled land mass. To go to and from Mont-St-Michel, pilgrims took a boat. Or, more often, they waited for the region's high and swift tides to recede sufficiently to "safely" walk across the freshly exposed sands. Many miscalculated the tidal cycles and drowned. Some were swallowed by the area's perilous quicksand. Mont-St-Michel seldom becomes an island. The causeway that was built about a century ago contributed to the silting up of the bay, damming the incoming water. Mont-St-Michel experienced other distressing times over its nearly 1,000-year lifespan. For example, portions of its aging sheer walls collapsed on several occasions.